See `Til Dawn open the final performance of the 2015 Mountain Play’s production of Peter Pan up on beautiful Mt. Tam and help raise funds for Youth in Arts programs. 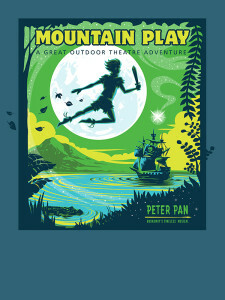 Mountain Play Association will donate up to $10 per ticket sold when you use the code YOARTS15 at the Mountain Play ticket link. `Til Dawn performs at 12:30 and Peter Pan begins at 2 pm. Mount Tamalpais State Park amphitheatre (directions and transport options available at www.MountainPlay.org) Tickets $40 General Adult, $35 Seniors (65+ ), $30 Young Adult (14-21), $25 Child (4-13). Children 3 and under FREE. Use YOARTS15 code at checkout to benefit Youth in Arts–up to $10 per ticket (except for Children 13 and under) will go to Youth in Arts! `Til Dawn is Youth in Arts award-winning a cappella ensemble for advanced Bay Area high school vocalists. Enjoy their set of rock, pop, blues, jazz and soul standards as you settle in and prepare to enjoy the Mountain Play–a Marin tradition since 1913!